Finding the right material for odd trousers - those worn with sports jackets rather than suits - is not easy. The kind of smooth, worsted cloths you're used to wearing as part of a suit are too sleek and formal. Many cottons, particularly garment-washed chinos, are too casual. The most popular alternative is flannel. In grey, it is a menswear classic and very versatile in its formality. But it has disadvantages - specifically, that it is too thick to wear for much of the year and is terrible at holding its shape: it bags quickly and is awful when wet. But I am increasingly turning towards cavalry twill, as a very versatile and functional alternative. And I would certainly put it above the various other wool twills, like gabardine, serge, covert etc. Among wool trousers, twills (those with a diagonal stripe running across the material) are particularly good for holding their shape and draping well. But usually the first twill a tailor will offer is a gabardine. This is the more traditional choice for an odd trouser, being more formal. But its formality and sheen make it less useful in a modern environment, when you might want to wear it with everything from a button-down popeline to a cowboy shirt (as pictured here). Cavalry twill is less shiny, largely because of the double-twill weave that defines it - if you look closely at the surface, you can see two lines running down in parallel, rather than the single twill found on gabardine, serge, covert etc. Part of cavalry twill's strength and durability is also reflected in the angle of that diagonal line. To make a twill line run more steeply - more vertically down the cloth, rather than across it - you put more warp ends in relative to the weft. Of the wool twills, serge usually has an equal balance of warp and weft, gabardine has more warp ends, and cavalry twill has the most of all. 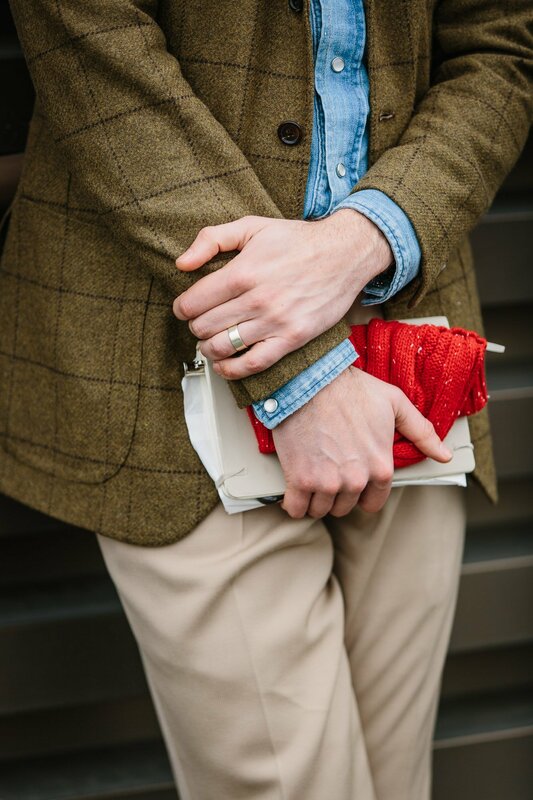 The trousers, by the way, were made by Richard James as part of a three-part commission last year that also included a mid-brown cashmere jacket (yet to be covered) and Harris tweed waistcoat (which I covered here). Both the fit and the make of the trousers was superb. Beautiful straight line, snug fit at the waist, and lovely pick stitching - around the fly, for instance. Savile Row tailors are not highlighted enough for the quality of their trouser work, largely because they will often be more expensive than Neapolitan specialists like Cerrato or Ambrosi. But the work is just as good, just often focused more on things like a precisely fitted lining to the band, rather than dozens of tack stitches. The cloth of the trousers is the Holland & Sherry cav twill I highlighted on my favourite cloths from them, last year. The jacket is my Escorial-cloth piece from Solito, seen in review here. The shoes are my old Edward Green Oundles. The cowboy denim shirt is from Niche via No Man Walks Alone. And the red-donegal beanie - which provides a nice pop of colour - is from Cappellificio Biellese (or CB1935 for short). You can follow the discussion on Cavalry twill for trousers by entering your email address in the box below. You will then receive an email every time a new comment is added. These will also contain a link to a page where you can stop the alerts, and remove all of your related data from the site. No Man Walks Alone is fantastic and they carry some really high quality companies and the service is excellent. Would you really advocate a trouser made from covert cloth? At around 550 gr., they would be very heavy indeed. I’d recommend cav twill first, but covert could work as well, yes. Great piece, Simon. When I look in my closet, it’s grey worsted, grey worsted, grey(er) worsted, grey flannel, grey flannel, blue chino, tan chino. Now I’ll be on the hunt for some twill. On the subject of trousers what are the colours that should form a staple in any gentlemans wardrobe ? Navy , beige, green …..? 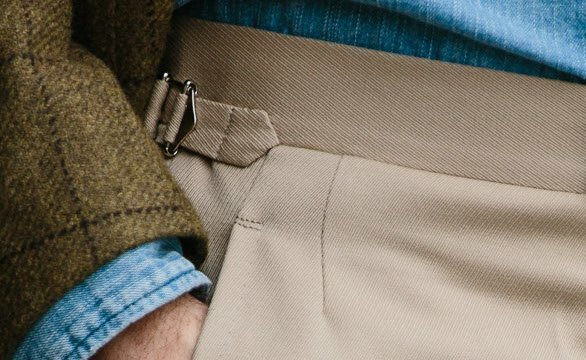 Great article – Cavalry Twill is definitely due a renaissance. One thing; I have a CT waistcoat that is (quite literally) over 100 years old. 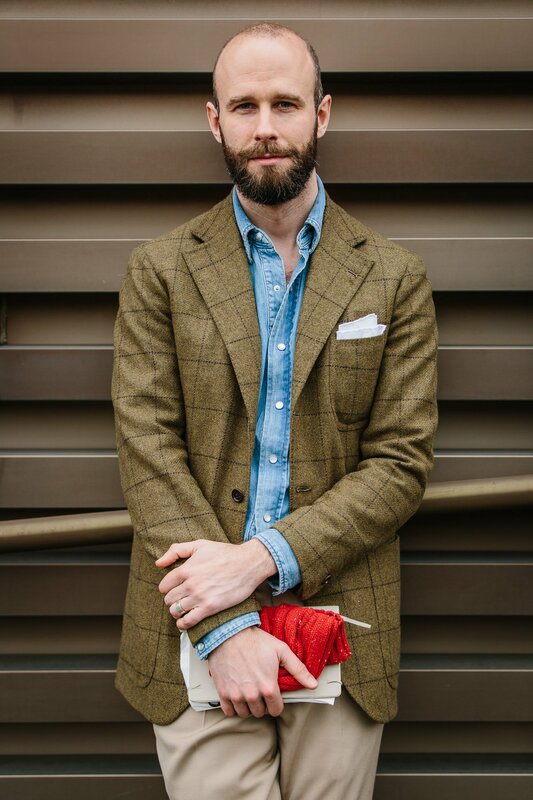 It wears well under a tweed jacket but I wonder how you think CT would work as a jacket fabric? In a dark colour, eg green or brown, it could be nice. I would go with covert perhaps though – I have a green-covert suit from Vergallo I am yet to right about that I think works very well in that regard. Thanks. Look foward to that piece. How does whipcord differ from CT? Is it a matter of angle of the weave? Whipcord is a single twill, and characterised by a vertical line. In addition, whipcord is a bit shiny. from my own experiences I can only confirm what you write about cavalry twill. I wasn’t familiar with this material but ordered a pair from New and Lingwood in sand. When I saw the material on photos I was a bit concerned it could look kind of synthetic. But then, I was really surprised about how versatile and comfortable to wear they are. Even when worn frequently, they hold their shape pretty well. Due to this and the plain front cut it’s easy to combine them with sports coats or even short length leather jackets. That said, they become one of my most worn trousers during the last time (besides grey flannels, of course). Beautiful trousers, Simon. I wonder if you could give us some tips on how you care and clean them. My trousers never seem to be the same after the first wash! Could you recommend any other makers that offer good cavalry twill trousers, rtw or other? Cordings are considered the home of the covert coat, and they do make a good cavalry twill trouser. Interesting. I like satinated cotton (smooth and a little bit shiny but not formal) for summer trousers and jackets but I am struggling to identify fabric merchants offering such them for tailors. I believe most are made in Italy. Do you know of any by any chance? I purchased a pair of rtw, CT trousers from Paul Stuart last fall, Nov. ’16. Trousers are a dark olive. PS also sold them in navy which were very nice. I chose the olive because I though it more versatile and find it so. I do also think that the navy would be versatile as well. I’m surprised, Simon, that I do not see olive listed in your cited posted on Trouser Colors? I just looked at PS´s website (nice initials by the way). They offer cotton cavalry twill trousers. You only mention the wool version, so I wonder what you think of the cotton one. Another reader recommends New & Lingwood. Are you familiar with their trousers? I believe you class cavalry twill as quite a formal cloth. What’s the reasoning behind this? To me, it appears more casual as the twill pattern is not smooth. It’s more casual than flannel, gabardine, high twists and other worsteds, which as i say is one reason i like it. Thanks for clarifying. Do you think, if the cut was slim, they could be worn without a sports jacket? Say, a field jacket or something similar. Any summer woollen fabrics you can recommend that would work in a casual outfit? Much like flannel in winter. Would you recommend turnups for these? There is no rule, and therefore no rule to be broken, but I think PTUs on a cavalry twill trouser is wrong. Given the heritage of the cloth, the correct finish is a military hem. Do you have details of the grey cavalry twill cloth? They don’t look to have a completely uniform colour. Is this correct? Almost like a marled effect. Eventually, we have the first post on CT. A few lines on weight might have been helpful. Just out of curiosity, do you think a pair of worsted trousers of a versatile colour (like charcoal/mid grey) can work as odd trouser? There are many examples where people do this, but the result often varies very much. Some look very nice but some not so nice. Are there any times that you would try that? Also, what do you thinks of the idea of combining worsted odd jackets and trousers? Perhaps in a little more formal setting than normal sports jackets + trousers in less formal fabrics like flannel? We come up against definitions here, as the wool in a pair of cav twills is worsted, as it is in high-twist Fresco. Really, what you’re struggling against is worsted with too hard a press, or fine a yarn, that then produces too shiny a finish. I’d recommend avoiding those and sticking to the materials we mention here. And I would definitely avoid odd jackets that have this worsted, suit look. Much worse and harder to pull off. Cavalry twill trousers. That brings back memories. The trouser of choice for members of the Young Conservatives in the 1960s. Preferably teamed with a tattersall shirt, a cravat, string back gloves and a Sunbeam Alpine. If only one could purchase the same quality clothes today at an affordable price. What’s the weight of your trousers you are wearing in the pic and cavalry twill does come in various other colors,i guess? Another characteristic is that cavalry twill wears cool for its weight. Apart from that it drapes and holds its crease well. Dugdale produce a very good, sturdy one . Regarding the cowboy shirt, are you wearing that off the peg or did you get it altered for fit? I tend to prefer flat fronts both because they look more contemporary and because pleats don’t deal well with my shape – a prominent seat that tends to force those pleats open and keep them open. Yes, cav twill holds a crease well. Generally people avoid treating cloth to maintain that crease because it detracts from the natural behaviour of the cloth. In the long term some artificial creases can cause the cloth to crack along the pleat as well. Pleats on cavalry twill? Good grief. First of all thank you for your invaluable work here, it means a lot. I wanted to know what’s your take on trouser linings as I’m going to have one made and wanted to know your opinion. Do you prefer half, full or no lining at all?. I’m including casual pants to (except jeans of course). Yes – cavalry twill is very fitting in the modern world where suits are less common. I have some trousers coming soon in moleskin – another of the cotton fabrics that is very comfortable for casual wear. 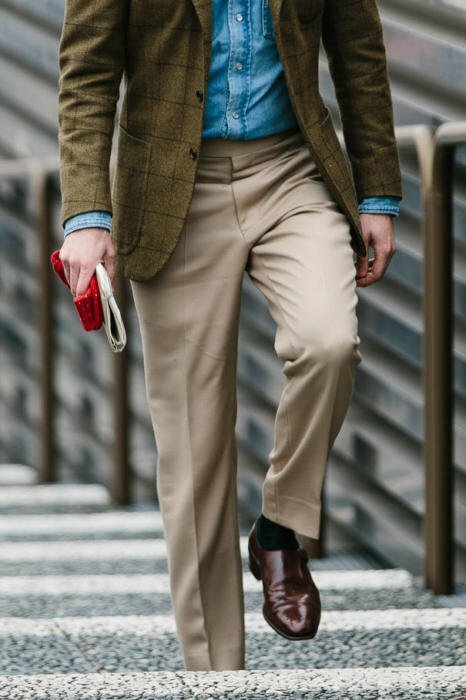 Given it’s work-wear history and somewhat floppy shape, it’s further down the casual spectrum, I think, than cavalry twill, but can still look nice with a casual jacket – maybe unstructured rather than structured. Would you agree? Yes i would, in terms of formality. I like the way the fly on these trousers is created to be flat and even and the lapp sits nice and tight against the waistband, with no corners popping up. I’m curious how this fly and lapped waistband are created? Such as – is it a zipper fly or button fly, 2 side-by-side hook and bar closures appear to hold the end of the lapp in place but I can’t be sure, and so on. 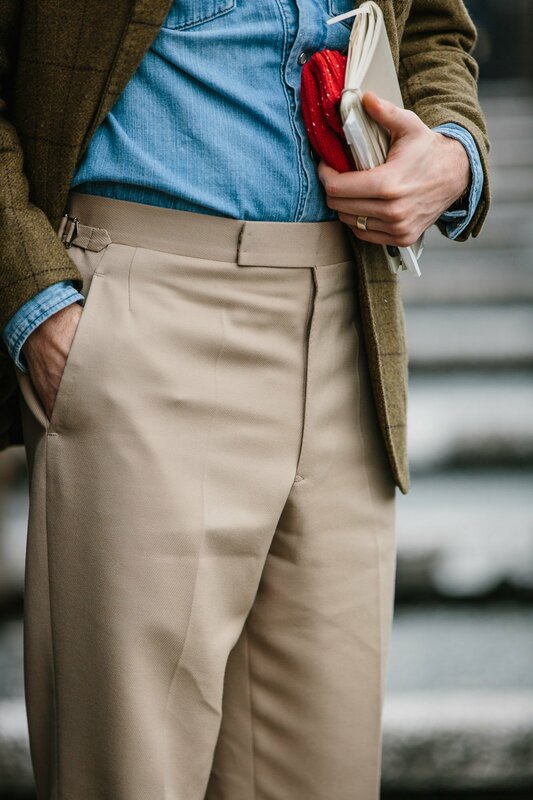 I know this is a little detailed but if you could explain each attachment piece of the fly, that would be great for my own trousers to match this similar look. Thanks for the help and a quick side note here – I voiced some concerns before about where things were headed for you and PM with the changes in the recent past, such as the revamped website, and your assurance that the important elements I’ve enjoyed since the beginning would remain unchanged. It’s nice to see those assurances are holding strong. Nice going! Thanks. It is a zip fly, there is a button in the centre above the fly and one hook and bar closure at the end. In my experience, however, these details are not what make the front lie clean – it is more caused by the construction of the lining to the waistband, the attention to detail and finishing there, and of course the fit to make sure nothing is pulling. Is there a prominent difference between cavalry twill and whipcord? Do you still feel that whipcord is more casual than cavalry twill? If so, any particular reason? Simon, your casual trousers always look spot on. If you don’t mind, could you offer up some advice in terms of rise and hem measurements? At 5’7 I’m finding it difficult to find options that I find both comfortable and aesthetically pleasing. My natural waist is above my navel and I have a rather long torso. Hi Simon, I notice you say you wear your pants at the waist but what height is this? I ask because my waist is about 3 inches above my belly button but you don´t seem to wear such high waisted trousers. Do you wear them at your belly button or above it? Thanks for this article. I will try cavalry twill for trouser next time. I wound like to ask if the cavalry twill trouser is suitable for hot climate? And which kind of flannel is better for trousers? worsted or woolen? Cav twill is OK for warm environments, but like many trouser cloths it is best when heavy, which won’t suit heat. I have ordered pair of trousers in the same cavalry twill as in this post so I’m curious how they will turn out. However when I went through H&S Dakota bunch I found very little choices for cavalry twill. Can you recommend some other mills and bunches for cavalry twill with more colors? Colors like navy, cream, light fawn, chocolate and so on? You mention that CT trousers are relatively durable. Do you have any experience in cycling in them? What I mean here are very short (2-3 km) commutes on a city bike. I would not do it in flannels but for CT it may be possible. What do you think? Simon, you use so many trouser makers it’s difficult not to lose track! If you had to use only one, which one would you keep out of Pomella, Cerrato, Whitcomb & Shaftesbury, Richard James…? It’s not an easy question… W&S is great for value, Pommella/Cerrato for finishing and details. Can I at least have two? Finishing aside, any difference in style? I was particularly interested in the differences between English and Italian, especially W&S. Is this Cavalry cloth thick enough for autum and winter trousers? I am still looking for a cold season alternative to chinos. Sounds tempting. Where would I get this exclusive rewove cav twill? Hello Simon, a question (or two): What do you mean when you say Flannel ‘bags’? And what do you mean it doesn’t work in the wet? You mean it holds onto water too long? Also, I have two pairs of trousers in a cavalry twill, but heavy cotton, not wool. Do you think they can achieve the same level of formality? It can lose its shape, particularly around the knees. In the wet this happens more, and it is more likely to rip when wet too. Thanks for responding! Follow up: how do I treat the bagging of flannel trousers? Hang them in the shower with me, iron under a towel, just fold them well? You have to re-press them, so yes iron under a towel. I, and I believe many of your other readers, would love to see a segment by you called, “What I am Wearing Today”. The title is self-explanatory. It can be as random as you have time for and shouldn’t take much writing work as you would merely just give us some short description of the items you’re wearing on that particular day and maybe where you are headed and why you picked what you are wearing; quick and dirty bullet points – with pictures/ or a picture even- of course. Think of it as a more detailed sequel to the piece you did a while ago telling us how you decide what to wear every morning. The thoughts are appreciated, thank you. I do like publishing images like this, and descriptions, and I know readers like them. However, I do also like to get use decent photography, and put some thought into what I’m writing about the pieces. As a result it’s hard to commit to doing quite so much extra coverage. I will carry on doing these pieces, but I would also suggest browsing through the Lookbook (which has worked well – thanks) and following on Instagram, where I do sometimes do Stories about little things I’m wearing each day. Would this colour cavalry twill complement your brown Harris tweed jacket? Also, I’ve seen heavy Jacketing flannel (540g) on the Fox Website, is this still OK for trousers? Yes it would I think. Would you recommend forward pleats on cavalry twill trousers? And are Dugdale’s or HE Box’s cavalry twill good for trousers? No more or less than on other materials really. They will look a little more dressy/sartorial, but they should hold a nice sharp line given the structure of cavalry twill. Thanks. The Dakota cloth from H&S seems a bit light being 13oz. If you re-ordered these trousers, would you choose a heavier cloth? Thanks. So the 16-21 oz from Dugdales (and 990g from HE Box) would be too heavy? Certainly anything more than 16oz would feel very heavy. Thanks! The Dugdale “Light Fawn” is 21oz, so that does sound a bit too heavy then..
Talking to Russell at GB it looks like a lot of the classic Cavalry Twill is around the 20-21 oz mark. I understand that this is also the “classic” weight for trousers in this type of cloth. Would I end up with something unwearably warm at that weight and what is your view that such heavy weight is the classic/traditional weight? It’s the traditional weight just because it’s been used most for really rugged clothing, even outerwear. I don’t think it would be unbearably hot at 20-21. It would be wearable. It’s just that you’d end up not wearing it for large parts of the year. Trousers made of 20-21oz CT are warm, but less than those made of flannel. I am using mines until late spring, more or less until the moment when I am moving to lightweight wool / linen. The big advantage is that they need very little pressing. Great for travelling. Thanks Daniel, that’s helpful to know. Simon, do you btw know what weight Cording’s Cavalry Twill trousers are?